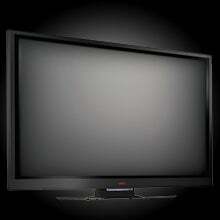 High End Budget HDTV: Vizio VP605F VP504F 1080p Plasma Has Silicon Optix HQV Reon Processor Inside?! Vizio's most astounding HDTV today are these plasmas with Silicon Optix Reon image scalers, some of the best video processing gear around, which handles interlacing and upscaling when running anything lower than 1080p on these TVs. So your standard def TV and DVDs look better. This sort of circuitry isn't found in even many high end sets, so its amazing to see budget TV maker Vizio pack the right gear. How about the glass? I don't think it'll be as beautiful as a Pioneer or Panasonic Plasma, but check it out: Contrast ratio is at a high of 30,000:1, due not to deeper blacks but greater light output (traditionally a plasma weakness), and it has 4 HDMI 1.3 inputs. It also takes deep color avail through that HDMI 1.3 connection and processes it at 10 bits. It comes in 50 and 60 inch models. June arrival, estimated MSRP of $1699 and $2899. The Catch: Two HDMI ports are on the side. Only one needs to be. I have to look at the glass live before judging this thing. The 50-inch sounds like a steal, though. series of ultra high-performance Plasma technology displays. While the new VIZIO VP605F boasts 60"
this allows users to achieve full resolution with picture-in-picture images. television programs with or without paid high definition service. plus a new remote control makes it even easier to operate TV and other system component functions. processing which output 4:4:4 color processing which renders more than one billion colors.